Salmon is almost a staple food here in the Pacific Northwest and we can never seem to get enough of it. 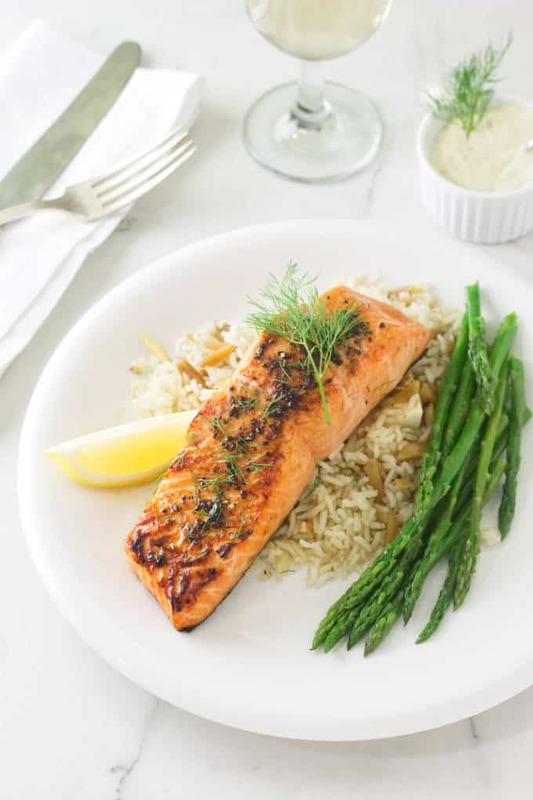 Our recipe for Broiled Copper River King Salmon is a delicious treat for a special dinner-for-two. A wedding anniversary qualifies for this feast! Wild salmon is high in fat and rich in the heart-healthy Omega-3 fatty acid. It is one of the best and healthiest fish you can eat. The flesh cooks up moist, succulent and delicious. The vibrant color of wild salmon comes from the huge amount of krill in their diet. Krill contains astaxanthin, a red pigment that lends the flesh of the wild salmon the vivid color ranging from bright orange to deep red. Of the five major salmon species, the Copper River is the birthplace of only three of the species; the King, Sockeye and the Coho. The salmon migrate from their birthplace to the Gulf of Alaska where they live several years as adults. They begin their return trip to their birthplace between May and September. What Is So Special About Wild Copper River King Salmon? 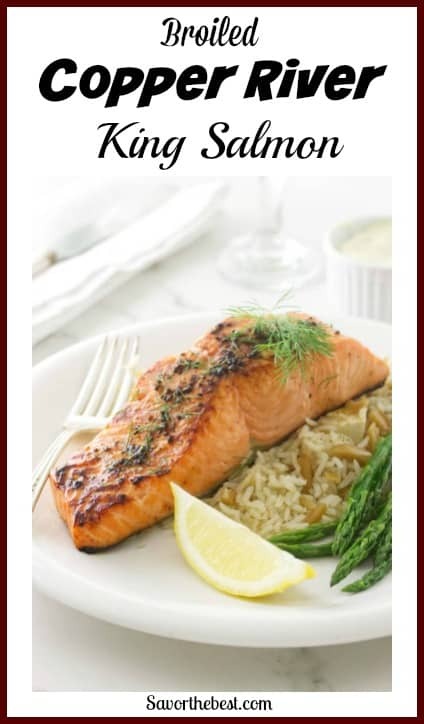 Copper River King Salmon are packed with rich Omega-3, the good fat! Before these salmon head off on their epic journey from the Gulf of Alaska to inland waters, they store up a lot of fat as energy. That fat will sustain them on the formidable trip up the river to where they were born. The Copper river is a treacherous 300-mile long river with steep portions the salmon must navigate. The longer and more difficult the journey the more stored fat the salmon needs. They do not feed while on their journey. They travel all that way with one goal; to spawn, then they die. That does seem a rather sad life. Wild Copper River King salmon, also known as Chinook, are aptly named as they are the largest of the species weighing in at about fifty pounds. The King is the fattiest and richest in Omega-3 of the species. They are also king of the wallet and among the more pricer fishes in the fish market. These beautiful broiled Copper River King salmon fillets, however, just happen to have been gifted to us from a friend. Nice, huh? The salmon fillets get a brief soaking in a salty-sweet brine, which intensifies its natural flavor and helps to retain moisture. But the main reason we brine is to reduce or eliminate the album that oozes out of the salmon as it cooks. I know it is a natural process and harmless, but it is unappetizing. The short salty-sweet soak is an easy fix. 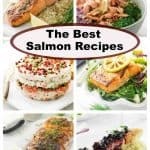 How Do I Make A Brine For This Salmon Recipe? All you need to make a brine is water and salt. We used a bit of brown sugar to enhance the natural sweetness of the salmon and to improve the browning. You should use one tablespoon of salt and one teaspoon of brown sugar for every cup of water. The amount of water you will need depends on the size of the dish you use to soak the salmon. The best way to know how much water you will need is to place the salmon in a dish then use a measuring cup to pour water over the salmon. After the salmon is submerged in the water, remove the salmon so you can stir in the salt and sugar. Keep stirring until the salt dissolves. Now you can place your salmon back in the brine solution and let it sit for a while. The dish we used to brine our salmon required four cups of water so we used four tablespoons of salt and four teaspoons of brown sugar. That might seem like a lot of salt but it is only a 9% solution. That is what you need for the brine solution to start breaking down the muscle fibers of the fish. About that last tip. 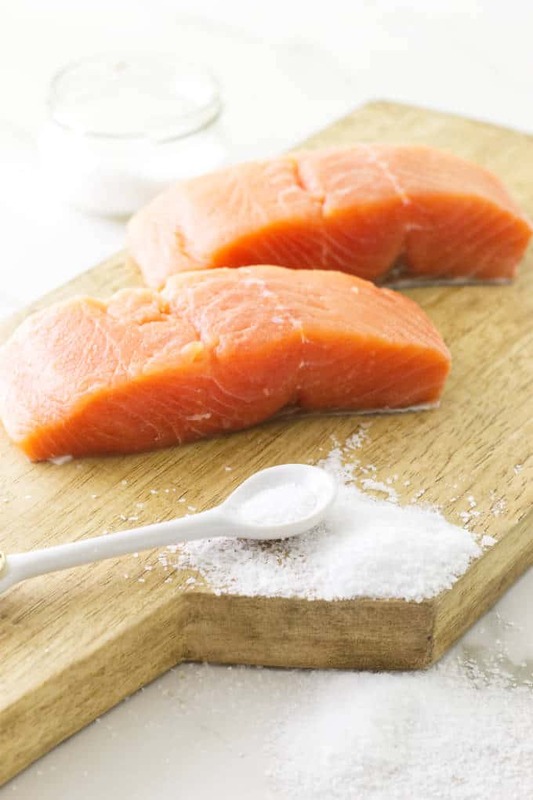 If you let the salmon sit in the brine for longer than ten minutes it can become too salty. It doesn’t take longer than ten minutes for the salt to work some magic on the muscle fibers of the fish. If you have ever made smoked salmon or another type of preserved salmon like this salmon gravlax, you know that those recipes call for a very long soak in the brine solution. Often several hours and sometimes days. But this recipe isn’t about preserving the salmon. Our goal is to bring out the fresh succulent flavors of the Broiled Copper River King Salmon and prevent that white stuff from oozing out. And we want it to be moist and tender. That is what this brine will accomplish. Oven broiling is our preferred method to cook these Copper River King salmon fillets. This method even beats grilling as there will be no flesh sticking to a grill. When I want to cook heart-healthy salmon fast and easy, I go for the broiler. It takes just minutes for that direct overhead heat to cook these fillets. We prepared these salmon fillets ‘straight up’ with just butter, lemon, salt and pepper. No sauces or fancy seasoning to mask the delicate flavor of these Copper River King salmon fillets. They are juicy and moist inside with a rich crust over the top. 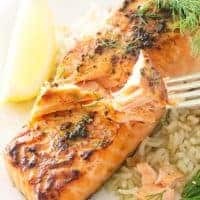 Some folks like the salmon skin to be crisp and crunchy but that is difficult to do when salmon fillets cook from the top under a broiler in just minutes. So, to get a nice crisp skin without having to flip them, the fillets were placed on a really hot cast iron griddle, skin side down and slipped under the broiler for eight minutes. When done, the salmon was crusty on top while the skin on the bottom was crisp from the hot skillet. Place the oven rack four to six inches from the heat (depending on how thick your salmon fillets are). Put your cast iron griddle in the oven and preheat the broiler. Let that griddle get nice and hot! After a brief brine, rinse the salmon fillets in cold water and pat them dry with paper towels. Give the fillets a brushing of melted butter, a drizzle of lemon juice and a sprinkling of salt and pepper. Pull the hot griddle out of the oven (using an oven mitt) and place the salmon fillets on the griddle, skin side down. Now stick the griddle back in the oven for eight to ten minutes. I like my salmon cooked to about medium rare which is between 120°F to 125°F. If you like your salmon more well done, then cook it to 130° to 140°F. Try not to cook it any further than 140° or it will be dry and chalky. For best results use an instant-read thermometer. If you follow these steps, your salmon will be tender and flaky with a nice crisp skin. 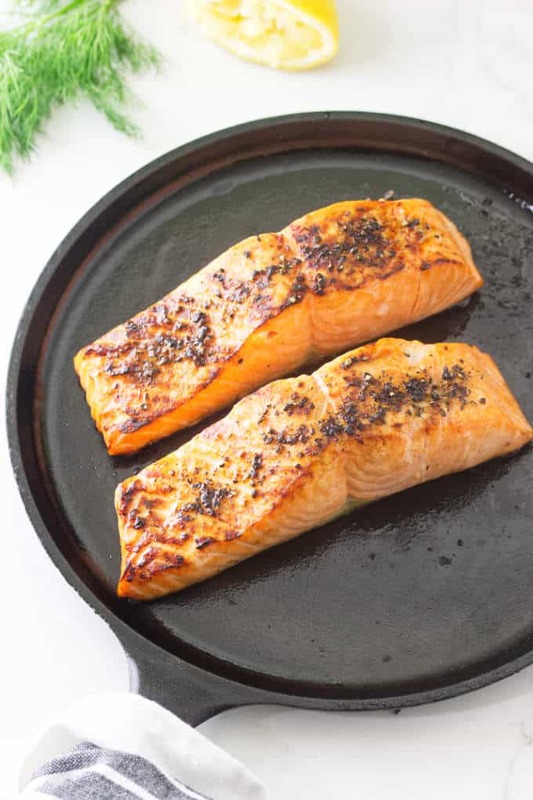 A word of caution when you pre-heat your cast iron griddle….I love my cast iron griddle for broiling these Copper River King Salmon fillets but I keep my silicone oven mitt ready as a reminder that the handle is hot. Experience can be a great teacher! 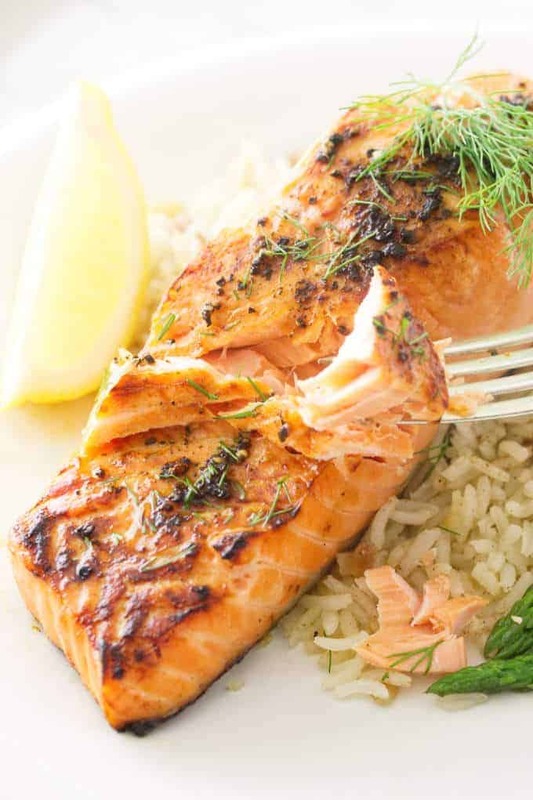 There are three important things to remember when broiling salmon fillets. Place the oven rack to the top portion of the oven. 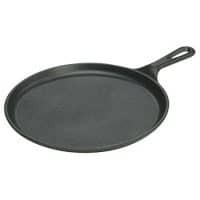 The rack should be high enough so when you place a broiler pan or a cast iron skillet with salmon fillets on it, there will be a 2-inch distance from the heat for every 1/2-inch thickness of salmon. For 1-inch thick fillets they should be 4-inches from the heat. This prevents thicker cuts from overcooking on the outside before the center is completely cooked. Then leave the door cracked so the heating element stays on continually. 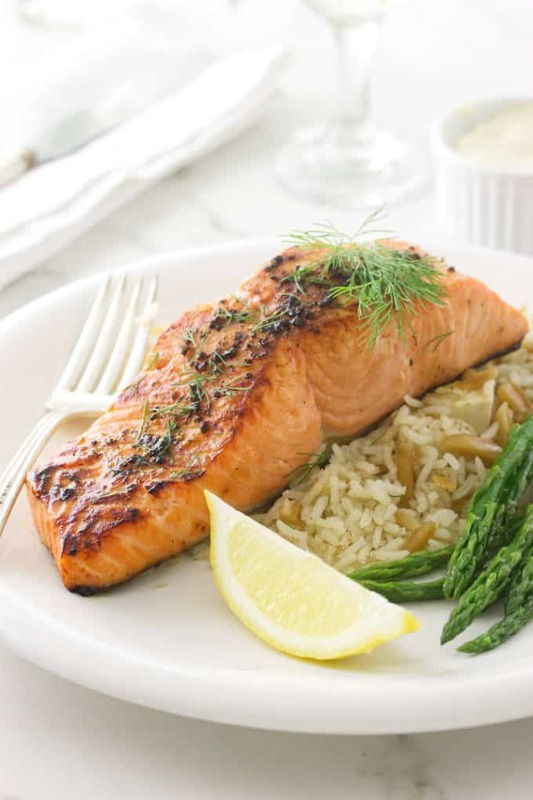 We served these broiled Copper River King salmon fillets with a fluffy basmati rice pilaf and sautéed fresh asparagus. Although there is much to-do over the salmon from the 300-mile Copper River there is another river that is much longer. The Yukon River is over 2000 miles long and the King salmon have 30% more rich fat than any other salmon. Imagine that! This vibrant, red-fleshed Broiled Copper River King salmon is rich, succulent and melt-in your mouth delicious! A simple briny soak keeps the flesh firm, moist and beautiful. Serve with basmati rice pilaf, steamed asparagus and your favorite green salad. Place the salmon fillets in a dish in one layer and cover with the brine mixture. Allow it to sit for 10 minutes. Removed the salmon fillets from the brine, rinse under cold water and pat them dry. 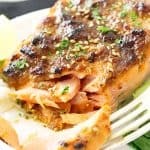 Let the griddle get hot before you cook the salmon. Place the fillets, skin side down, on the hot cast iron griddle. Brush each fillet with melted butter and squeeze lemon juice over the tops then sprinkle with salt and pepper. Keep fresh salmon in the refrigerator in an air tight container or wrapping until ready to prepare. It is best to eat fresh salmon 3 to 5 days after purchase. It can also be frozen on the day of purchase and kept frozen for up to 3 months. If your product is vacuum sealed, it can last up to 8 months in the freezer. Salt is difficult to dissolve in cold water; a quick method is to first add the salt to a cup of hot water, stir until it dissolves and has cooled. Then add the salty water to the with the cold water, creating the brine. 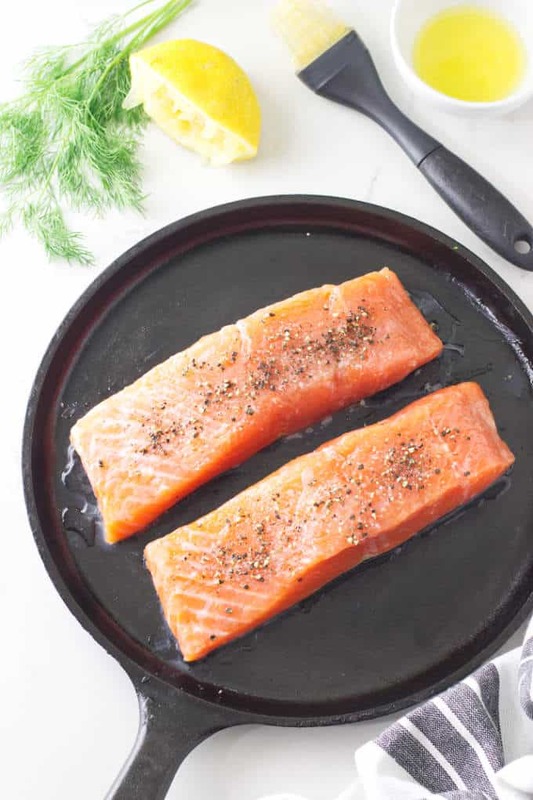 Place the top rack of your oven high enough so when you place a heat proof skillet like a cast iron pan with the salmon filets on it there will be 2-inch distance from the heat for every 1/2 inch thickness of salmon. For 1-inch thick fillets they should be 4-inches from the heat. This prevents thicker cuts from overcooking on the outside before the center is completely cooked. To determine how long to cook your salmon, rare is 110°F. Medium rare is 120-125°F. Medium is 130°F and well done is 140°F. I’ve been using a really similar brine with seafood for a couple of years now. 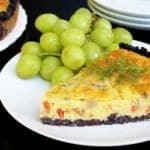 It really makes for better flavor, and is quick and easy to do. Haven’t tried this method with salmon for some reason, though — gotta try it. Fantastic post — so much nice detail. Good recipe, too. 🙂 Happy Anniversary!